For most people, the bedroom is a place of reprieve. It means safety, security, and relaxation. We spend a third of our lives sleeping, so the room we choose to rest in must be exceptional. It is the place where we prepare for the day and the room we retreat to in the evenings. The truth is that bedrooms have come a long way from just the distant back room with a bed in it. Many times they double as an exercise room or even an office space. Bedrooms reflect the disposition and the lifestyle of the people they belong to, so they are often the rooms with the most personal décor. Bedroom designs vary with the tone and shape of the house and the personal characteristics of the people they belong to. Dormers and alcoves, often found in bedrooms, offer plenty of options for bedroom décor ideas. They can be utilised for storage, display, or even just to tuck a bed or chair into a cosy nook. Multiple lighting fixtures offer ample opportunity to reflect various settings and create ambience. Lamps with soft lighting can be used to create a cosy intimate appeal and brighter overhead lights are necessary for daily activities. Bedroom decorations should be more than just paint covered walls and pretty bedding. An exceptional bedroom, with a functional disposition, utilises colour tones and themed textures as a foundation to showcase the most important personality traits of the people who live there. Your bedroom should highlight your individual style and reflect your personal taste because the right bedroom makes your house feel like a home. 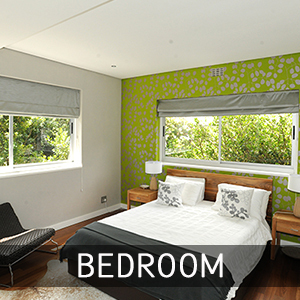 Bedroom designs must also be functional in a way that out-performs the other rooms in the house. We can help you create that perfect sumptuous bedroom that constantly beckons you to retreat into its polished serenity.